these pictures of pursuing learning as an adult. One thing being an adult has taught me — even before I ever heard of unschooling or wanted to pursue that for my then-future kids — is that learning never stops. There is no window to learn something that then closes and you don't have a chance anymore — there's always a new opportunity to educate or train yourself. I did really well in school, kind of too well. By that I mean that I knew how to play the "game" of school — parrot back what the teachers wanted to hear, get good grades on tests, behave properly — and yet I didn't fully understand the point or value of learning for learning's sake until I was nearly out of academia. I'd thought about going for a master's degree, and, not to knock anyone who kept on into higher and higher education, I'm personally glad I decided to stop after my bachelor's. I'd had 19 years of being in school, from preschool on, and it was time to stop schooling and start learning. It was actually my senior year of college where that thought had (finally!) kicked in: What was beyond for me, the good-grade-earner schoolgirl? How would I find value? How would I prove my worth? Was I able to direct my own life without others determining my path for me? As a real, live grownup, I could suddenly ask myself: What do I want to know? And then I could take steps to learn it! No more memorizing dates and figures for the sake of a test and taking required classes — now I could choose what was important to me. I'd always wanted to take ballet — so I did! I wanted to learn how to make hats that fit my ginormous skull — so I did! I took classes on yoga for meditation, watercolor painting, photography, acting, and singing. I learned how to stop trying to please a teacher and learn how to please myself. I had chosen these classes, and I was paying for them, and I let myself get out of them what I wanted. But it wasn't just classes. Anytime I had a yen to learn something, I figured out how I could. I taught myself, with Sam's help and various tutorials, how to code basic websites. I learned some graphic design skills for my job. I read books on medieval history and, long before CSI was a thing, watched countless documentary shows on forensic investigation techniques. I started teaching myself French, because I felt like I'd missed out on that in school. I scoured Google Scholar for research articles to help myself understand various arcane topics, such as car seat safety. I transformed my years of classical piano lessons into self-educating myself on how to improvise, and I set down to try my hand at songwriting. When we were laid off and decided to settle into starting our own series of businesses, I learned about licensing, taxes, and legal issues. 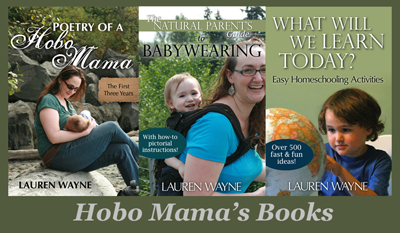 I, naturally, have spent years pondering, researching, and practicing being an attachment parent. For all these topics and many, many others, I spent hours glued to websites and poring over stacks of books I'd checked out of the library. I visited museums, attended performances, participated in workshops. I realized my mind was a sponge, and there was — thank goodness! — no way to fill it. And so it makes me goggle at anyone who suggests that it's too late to learn something, or that kids need to learn something by a certain age or the window has closed. Anytime someone laments not learning a subject or a skill as a child, I want to shout: "So go learn now! What's stopping you?" Whether it's bike riding or kite flying or trigonometry or Lithuanian, go ahead and start now, and enjoy the process since you're the one in control of it. I want my boys to take ownership of their education — to figure out now, and in the future, what it is they want and need to know, and then seek to fill those gaps. There's no shame in being ignorant of something. Honestly, we simply cannot know everything; we all have to specialize to some extent. There's only shame in wanting to know something and doing nothing to help yourself. But I think most of us do in fact know that, and we as adults pursue our passions in ways we might never have dreamed possible when we were slogging through worksheets and assignments at school. Think about the hours you've put into some hobby or dream of yours for no external reward like a grade or gold star, just your own satisfaction in learning something new and being better at it a little at a time. That's the kind of learning I wish for my sons, and for myself, and for you. What have you taught yourself? What do you want to learn next? Lifelong Learning — Survivor at Surviving Mexico--Adventures and Disasters writes about how her family's philosophy of life-long learning has aided them. Inspiring Children to be Lifelong Learners — Donna from Eco-Mothering discusses the reasons behind her family's educational choices for their daughter, including a wish list for a lifetime of learning. Always Learning — Kellie at Our Mindful Life loves learning, and lately she's undertaken a special project that her family has been enjoying sharing with her. 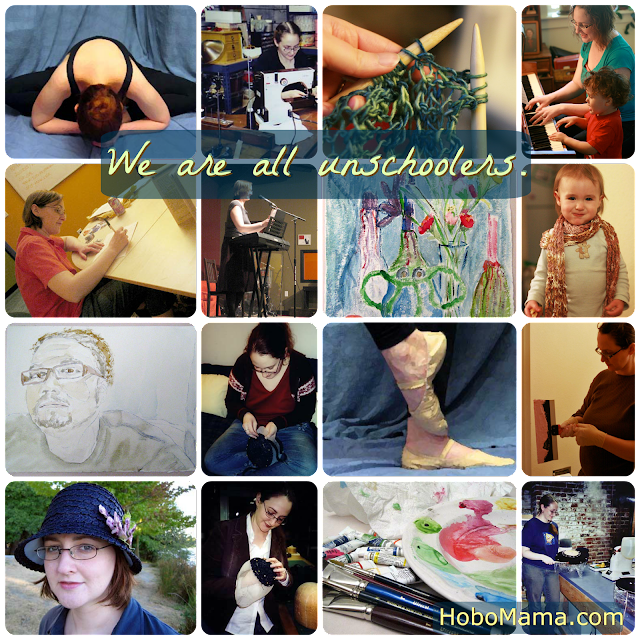 We're all unschoolers — Lauren at Hobo Mama embraces the joy in learning for its own sake, and wants to pass that along to her sons as she homeschools. Never Stop Learning — Holly at Leaves of Lavender discusses her belief that some of the most important things she knows now are things she's learned since finishing "formal" schooling. Facebook: The Modern Forum — Dionna at Code Name: Mama explains why Facebook is today's forum - a place where people from all walks of life can meet to discuss philosophies, debate ideas, and share information. Hi Lauren, thanks for sharing your views on lifelong learning, such an interesting topic to write about. I've also spent many hours learning about attachment and natural parenting, and more recently finding out more about home education as we're just at the start of that journey too. I also spent many years in school and university, to afterwards find I experienced so much more freedom when my learning was self directed. There is a world of learning out there as a parent with (a little!) free time, I'm excited about the avenues which are opening up to me and my children. Oh how I feel you wrote a bit of my life, or read my life's book that hasn't been written lol! I have been doing much of the same, especially since finishing graduate school, which honestly, was hard because of the "game". I also have used that same phrase "game of school" since I was pretty young, so it was interesting to see that written out here. Love this post, especially after having recently battled a bout of anxiety about all the things I "didn't do" (and probably never will). I keep telling Kieran that it doesn't matter to me what he does when he grows up, as long as he finds something he is passionate about. Isn't that what makes life worth it?! I think part of what is missing in the traditional school setting is the passion of learning. It's all about what you should know but very rarely about what you want to know. Glad you have been able to take off in your own learning and I'm sure you are a great model for your children. I, too, was an ace at school, but so much of what I "learned" I have not retained. Since school, I have taught myself genealogy, how to run a business, website basics, attachment parenting, cooking, basic car maintenance, how to write blog posts, etc. And you're right - it is more fun and longer lasting when we learn the things we're passionate about. Thanks for sharing! The more of this I read, the more I wanted to like, reach through the computer and hug you! LOL! I 100% agree with pretty much everything you said. Except that I *did* figure out in school that I could learn what I was interested in and not really pay much attention to the rest, and still pass the classes. I have learned SO much as an adult! I actually have more trouble at this point in stopping myself from digging into new ideas and topics because they are lower priority for me right now than others. I love seeing this same mentality in my kids already, that they can learn whatever they want to, and reach the proficiency level they are happy with. I was always the exact same kind of student as you: I was great at writing what the teachers wanted to read, memorizing names and dates, and regurgitating all of that info to pass a test. I think it's so sad that teaching to the test is the norm, and people like you and I look back on our years and years of schooling with something akin to regret. The things we learn on our own, because we WANT to learn them, are the things that truly stick with us. I am hoping I will be able to instill such a love of learning in my son. Or rather, I am hoping that I will be able to keep his love of learning alive and burning brightly, so that he, too, will keep learning things everyday. @stoneageparent: "I also spent many years in school and university, to afterwards find I experienced so much more freedom when my learning was self directed." Yes! Glad this resonates with you as well.